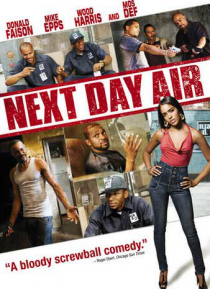 Donald Faison (Scrubs) stars as a hapless delivery man who finds himself at the center of a drug deal gone horribly awry in NEXT DAY AIR, an uproarious action comedy with an all-star cast. Life isn't going smoothly for Leo Jackson (Faison). He still lives at home, he just broke up with his co-worker girlfriend and he's had so many complaints about his sloppy work habits that his own mother is thre… atening to fire him. But Leo isn't one to let a few bad breaks ruins his day - as long as he's got plenty of weed to take his mind off his troubles. But when the wacked-out courier accidentally delivers a box containing 10 kilos of high quality cocaine to the wrong apartment, it sets in motion a hilarious and harrowing chain of events that could cost him his life. Once the intended recipients of the package, wannabe gangster Jesus (Cisco Reyes) and his feisty girlfriend (Yasmin Deliz), realize the box hasn't arrived, they set out on a desperate search to find it before ruthless drug kingpin Bodega Diablo (Emilio Rivera) notices it's missing. Jesus' next door neighbors, a pair of bumbling thieves named Brody (Mike Epps) and Guch (Wood Harris), on the other hand, can't believe their luck when the unexpected package arrives. They arrange to sell the coke to Brody's drug dealer cousin (Omari Hardwick) and his tightlipped bodyguard (Darius McCrary). Furious over the loss of his shipment, mob boss Bodega will stop at nothing to get it back. Discovering it was Leo's blunder that caused its disappearance, he threatens to kill Leo if he doesn't fix his mistake. With the drug deal about to go down, all parties are on a collision course that's almost certain to end in heavy gunfire. And whoever's still standing when the smoke clears could walk away with nearly a million dollars in cash and drugs.